Billy isn’t yet ready for his walkabout. It’s time for Billy to become a man. Becoming a man in Billy’s world involves a knife where it shouldn’t be and a lot of blood. Can the spirit of his mother help him through and help him prepare to find some girls? 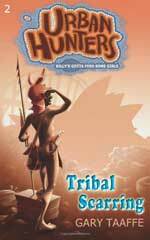 Tribal Scarring (Urban Hunters) is the second book in the Urban Hunters series.